Several students and faculty from the WKU Department of Geography and Geology attended the annual meeting of the Geological Society of America. 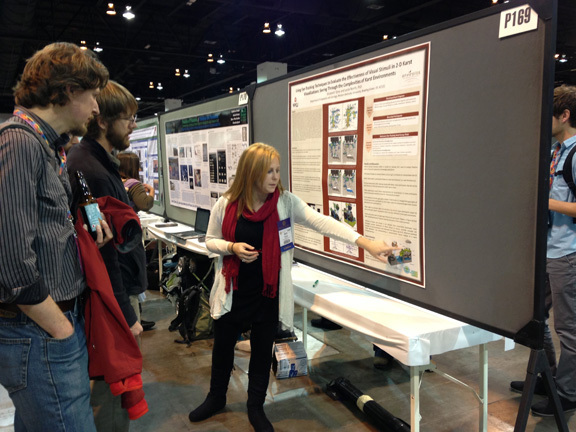 WKU graduate student Beth Tyrie describes her thesis research about karst visualizations. WKU students and faculty engaged in several activities, including poster and oral presentations, moderating sessions and hosting a departmental expo booth. Students also attended paper sessions, explored graduate school and postgraduate career opportunities and learned more about the professional side of the geoscience discipline. Celebrating Advances in Geosciences was the theme of the GSA’s 125th anniversary meeting, held Oct. 27-30 in Denver. Dr. Leslie North from the Department of Geography and Geology co-chaired a session on Sustainability in the Geosciences. The expo booth showcasing WKU’s Department of Geography and Geology and its programs was a great success, with dozens of prospective students and collaborators visiting it throughout the meeting to get information and to enter applications for scholarships offered by the Hoffman Institute’s Karst Field Studies program and Crawford Hydrology Lab. Several students and faculty from the Hoffman Environmental Research Institute also attended the annual Friends of Karst meeting that is held at GSA, where discussions on current and new directions of research in the discipline of cave and karst studies were led by some of the world’s top karst scientists. 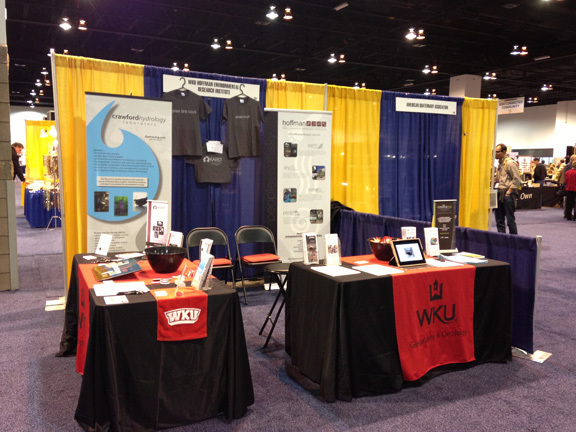 An expo booth at the Geological Society of America meeting showcased WKU’s Department of Geography and Geology. Geochemical and Mineralogical Analysis of Cave Deposit to Reconstruct Climate Change in Barbados for Water Resource Management, a poster by undergraduate geology major Lowell Neeper, Dr. Jason Polk, former Geoscience graduate student Gilman Ouellette, Dr. Aaron Celestian (WKU Advanced Materials Institute Director), and Dr. Yemane Asmerom and Dr. Victor Polyak of the University of New Mexico. Using Cinder Cone Morphology to Constrain Age (San Francisco Volcanic Field Reu), a poster by undergraduate geology major Sarah Zibark, Emma Gleeman of Brown University, Dr. Mattia Michieli Vitturi of Istituto Nazionale Di Geofisica E Vulcanologia, and Dr. Fabrizio Alfano, Dr. Amanda Clark and Rob Dekko of Arizona State University. Sustainable Practices in Geotourism at Show Caves: An Investigation of Interpretation and Management Approaches in the USA and Europe by Dr. Leslie North, Geoscience graduate student Beth Tyrie, and Dr. Jason Polk. Techniques to Better Understand Complex Epikarst Hydrogeology and Contaminant Transport in Telogenetic Karst Settings by Dr. Jason Polk, Dr. Chris Groves, former Geoscience graduate students Benjamin Miller and Sean Vanderhoff, and Dr. Carl Bolster of USDA-ARS. Evaluating the Effectiveness of Regulatory Stormwater Monitoring Protocols on Groundwater Quality in Urbanized Karst Regions, a poster by Geoscience graduate student Dan Nedvidek, Dr. Jason Polk, Tim Slattery of the City of Bowling Green Public Works Department, and Dr. Leslie North. Riverine Dissolved Inorganic Carbon Isotope Origin and Exchange Dynamics in a Kentucky Karst Landscape by Geoscience graduate student Kegan McClanahan, Dr. Jason Polk, Geoscience graduate student Laura Osterhoudt, and Dr. Chris Groves. Deconvolving the Controls of Landscape Evolution of the Ethiopian Plateau in a Continental Rift Setting by Dr. Nahid Gani, and Prabhat Neupane of the University of New Orleans. Diagenetic Compartmentalization of a Late Mississippian Reservoir in Warren and Butler Counties, KY, a poster by Geoscience graduate student Kort Butler and Dr. Michael May. Using Eye-Tracking Techniques to Evaluate the Effectiveness of Visual Stimuli in 2-D Karst Visualizations: Seeing Through the Complexities of Karst Environments, a poster by Geoscience graduate student Beth Tyrie and Dr. Leslie North. Addressing Water Resource Issues in Barbados from an Isotopic, Mesoscale, and Synoptic Characterization of Precipitation Variability, a poster by Geoscience graduate student Veronica Hall, Dr. Jason Polk, and Gilman Ouellette. Structural Deformation of the Rough Creek Graben within the Stable Craton Of Central North America by undergraduate geology major Evan Crowe and Dr. Nahid Gani. Toward a Reliable Proxy for Paleosalinity in Bahamian Lake Systems: Factors Affecting the Morphology and Valve Composition Of Cyprideis Americana (Ostracoda), a poster by former Geoscience graduate student Rachel Bowles, undergraduate geology major Jordan Seng, Dr. Fred Siewers, and Dr. Lisa Park Boush of the University of Akron. 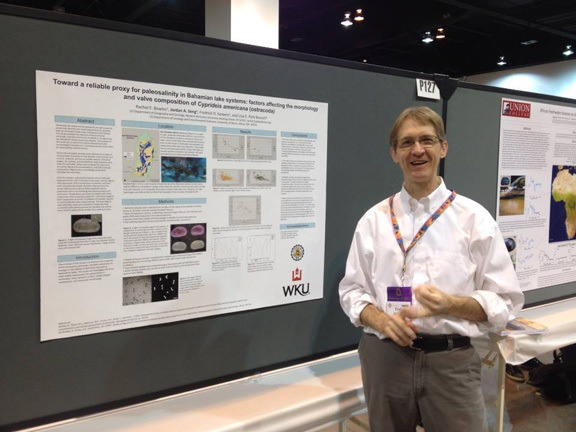 WKU faculty member Fred Siewers presented a poster with geology undergraduate Jordan Seng. Students attending the GSA meeting included: Lowell Neeper, Ellen Barringer, Aaron Holland, Kegan McClanahan, Evan Crowe, Kort Butler, Dan Nedvidek, Beth Tyrie, Jeremy Simmons, Jordan Seng, Sarah Zibark and Jonathan Oglesby. 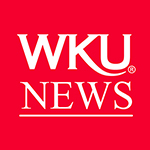 WKU faculty members in attendance included Dr. Michael May, Dr. Fred Siewers, Dr. Nahid Gani, Dr. Leslie North and Dr. Jason Polk. For many of the student attendees, this was their first GSA meeting or first time attending as a graduate student, including WKU Geoscience graduate student Jeremy Simmons. “Attending GSA was a great experience for me,” Simmons said. 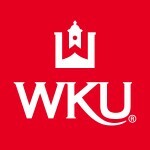 “I attended lectures, visited poster presentations, met aspiring WKU students interested in our program, and networked with colleagues at the annual Friends of Karst Meeting. The most valuable thing I got out of the experience was new ideas to incorporate into my thesis research.” Simmons, who was introduced to the WKU Geoscience program at the 2012 GSA meeting, is completing a thesis on climate change from cave sediment analysis in Belize under Dr. Jason Polk. Contact: David Keeling, (270) 745-4555.